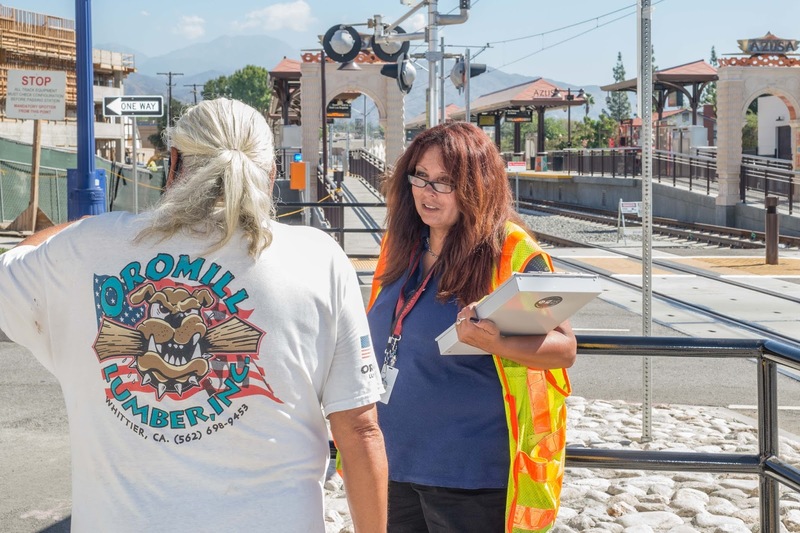 Metro Gold Line has stationed safety ambassadors at some of the new stations, including Monrovia, to prepare local communities for more frequent test trains. There are also safety ambassadors at Arcadia, Duarte and Azusa stations. They show people the proper way to cross rail intersections and hand out information on Metro services and programs and take feedback from the community. Use designated crossing areas and wait for the walk/crossing signal. If the gates are down, do not attempt to go around them. If a train is coming, be sure to stay behind the yellow warning stripes. Always stop, look, and listen for trains before crossing the tracks, and be sure to look both ways. Before starting across the tracks, be sure there’s room to get completely across.